Today’s launch of the Falcon Heavy, if it succeeds, will be one of the most important space developments in years. SpaceX CEO Elon Musk may be the most daring space engineer of our time, as well as the funniest. 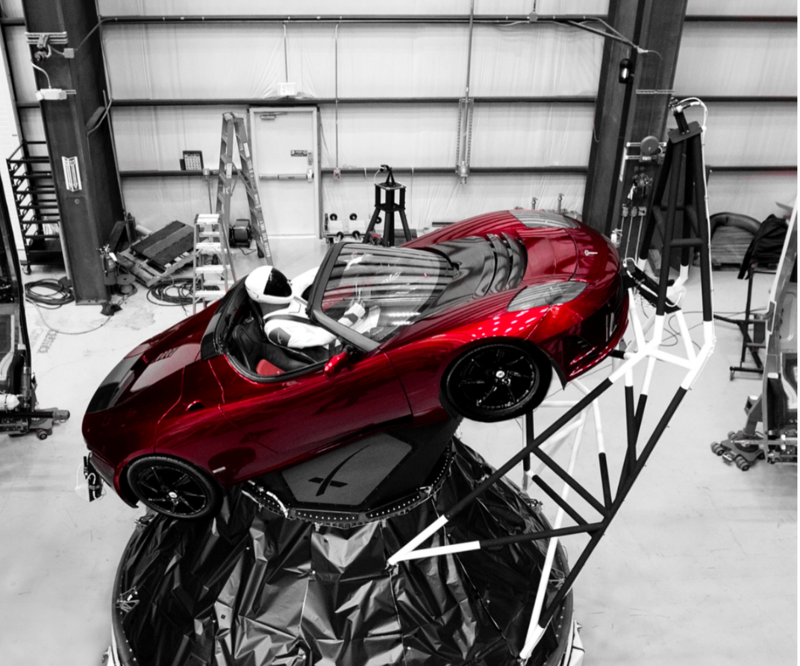 The above animation of his Tesla roadster heading off to Mars, an astro-bot’s arm hanging languidly out the open window, is pretty amusing, and straight out of a 1980s music video. It must be a blast to pull off stunts like this without having to run it past Public Affairs first, or worry what someone in Congress might think. That’s what happens when you build your own rocket without any government funding. This afternoon SpaceX plans to test the Falcon Heavy rocket that Musk first announced formally seven years ago. If it succeeds, it will immediately count as one of the most important developments in the space business in many years. Not only can the Falcon Heavy—essentially three Falcon 9 first stages strapped together—lift more payload than any rocket since the Saturn V, it sells for just $90 million a launch, far less than its competition. In his casual, not-seeming-to-brag-while-bragging manner, Musk told reporters yesterday that if the Falcon Heavy realizes his expectations, it will be “game over” for other heavy-lift rockets. He also said he will consider today’s launch a success if the rocket makes it off the launch pad without exploding. Keeping expectations low is fair, considering this is the first test flight. Musk worries most about dynamic effects between the three, side-by-side stages during its ascent through the atmosphere, and about the hours-long coast through the high-radiation Van Allen belts before the rocket fires its upper stage to send Musk’s red Tesla toward Mars. Although SpaceX hasn’t released the exact trajectory, the car will be placed in a Mars-Earth cycler orbit of the kind that Buzz Aldrin, among others, has been advocating for years. Musk figures it will circle the sun for hundreds of millions of years, regularly coming close to the Earth and Mars. If it makes it all the way out to the vicinity of Mars, we should get some spectacular pictures. Musk said yesterday that the roadster has three cameras on it. Presumably we’ll get shots of the car with Earth (and maybe Mars) in the background. How does he feel, on the verge of another one of his many big moments? “Quite giddy and happy,” he said yesterday. Many fans of space exploration, including his competitor Jeff Bezos, feel the same, and wish him well. The launch is scheduled for 3:45 p.m. EST [Note updated time] from Cape Canaveral, Florida; the launch window closes at 4 p.m. today. Live coverage will begin on the SpaceX website about 20 minutes beforehand.